In this week’s #fiveonfriday Facebook Live, I shared my best five tips to help elevate your about page to show who you are in the best possible light and make that magical connection with your ideal customers. Your about page is such an essential part of your website, and if you’re like most small business owners, you may have thrown something together just to have it there. Your about page is the most, or second-most visited page on your site, which means you need to take your page to the next level. Here are my notes from the Facebook Live, but before you go through them, I created a new story guide available. It’s called, How to Turn Your Website Browsers into Buyers; 15 Shortcuts for Storifying Your Website. Get it by clicking the button below. I see a lot of businesses use the third person on their about page. And for big business and huge teams, this is an excellent place to start. But let’s remember that people do business with people. And they want to do business with people they like. And they only get to like you if you personalize your about page, so they get to know the real you. 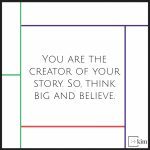 If you have a large team, then I recommend starting out with the business story but use your personal stories and those of your team to enhance the experience. To tie in my business story, I included catchy headlines that broke up my story into themes. For instance, two of my headlines include Chasing Boys, Pivoting and Playing Poker and another is Black Sheep, Solutions & a Leap of Faith. What I did group my stories into chapters and titled them. Then I wrote. I have a few sentences visible, and then a read more that expands that section if someone is interested. Now to tie it back to my business and related it to my ideal customer, I shared the lessons I learned along the way. That does a few things. It shows my experience, without telling them I’m experienced. It positions me as an authority, without telling them I know it all. It shows that I learned lessons along the way, relating to my ideal customer who might be struggling right now. Your about page is often the most visited or second-most visited page on your website. Yet, most people I talk to don’t give this page the attention it deserves and needs. If people learn about you, opt-in to your list, come across an article you wrote, the very next thing they are going to do, is going to your about page. It’s usually not the very first impression, but it’s often the second. So what do you want that say? It’s not enough to create attention, grab it or hope for it. You have to go after it. Even people that are seeking out information about you need to be wowed, or you’re going to lose them. You have to start with a strong headline – something that will calm the ADD mind. Think of the headline as an ad for the rest of your story. I’m not sure what way you’re supposed to swipe to show your interest (because I’m too old for that), but you want them to swipe that way. Create interest. That’s my best advice. My name is Kim Yuhl, and my business card says I’m an: optimist, strategist, and allegorist. I chose those words because they are accurate, they describe me, and what I do and they are unexpected. Then I start in with my story. One thing to remember as you create this page is that every line you write has a goal. And that goal is to get them to read the next line. Use that as your filter. And I say this from the personal experience of a rambler. I ramble when I talk, and I probably ramble more when I write – if that’s even possible. So edit and ask will this hold attention and will they care enough to keep reading? Of course, this is the main point of your about page, right? To let people know who you are and how you can help them. But it can’t be a list of achievements and testimonials. This is the place to get vulnerable and be heartfelt. People respond to people who make them feel something. So empathize and guide through your story. So being an optimist, strategist, and allegorist is great. So, exactly what do you do? The short story is after starting and selling two businesses and spending 15 years as an entrepreneur; I took everything I learned and starting sharing the big lessons with small business owners and entrepreneurs to help them grow their business. There’s credibility in the 15 years. I empathized by saying I get it; even my mom doesn’t know what I do. And then I started with a lesson giving a hint as to what is going to come. It doesn’t need to be in list form. It is more important than ever to get creative! 4. Call Them to Adventure! Knowing this is your most or second-most visited page is important information. This is the best place to make sure you are capitalizing on gathering leads. What is your core free-offering to gather contact information? Give them an option to get it here! Now, I get to say … do as I say not what I do, because right now, I’m switching a few things out, and I didn’t get my brand new Call to Adventure done in time for today. But right under I hope you choose to tell your stories, I give a resource to do just that. And I change it out every month. You don’t need to do that, but you definitely should have a way to collect a lead! 5. Stories. Stories. And More Stories. Duh, right? Now, I know I’m all about the story. But seriously, if you can only have a story on one page – it would be this page. Make people feel something. Let them in. Let them get to see a glimpse of the real you. And that won’t happen when you are talking in the third person, and it certainly won’t happen if you go about listing what you do. And that’s your five on this Friday. Now, before I let you go, I want to let you know I have a brand new free story guide available. It’s called, How to Turn Your Website Browsers into Buyers; 15 Shortcuts for Storifying Your Website. Until next time, remember … you are one story closer to achieving your biggest goals. 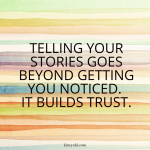 Your Brand Story Matters. Writing Tips for a Better Brand Story.